Who Should Use the Sennheiser EW 112P Lapel Mic? What Are the Top Features of the Best Wireless Lapel Mic? Why Did We Choose the Sennheiser EW 112P G4 As The Best Wireless Lapel Microphone For Church? Why Should You Consider Getting the Sennheiser EW 112P Mic? The Sennheiser EW 112P G4 is an omnidirectional wireless lavalier microphone system featuring two transmitters and mics. It is the top choice for wireless lapel microphones for church or other public speaking situations. The Sennheiser EW 112P lapel mic is a wonderful choice for those that need a high-quality set of lapel microphones at a decent price. You are getting two mics and two wireless transmitters, which may make this the best option for church services, live streaming, podcasting, and video production. Live Streamers may enjoy the clarity of the microphone pickup. You get clear speech and the option to choose between an omnidirectional mic and a cardioid mic. When there is a lot of background noise that you want to eliminate, you can give the performer or speaker the cardioid mic. This versatility also makes the EW 112P a great set for churches. During a church service, you may not want to hold a microphone or keep a large microphone on a stand. With this lapel set, you can discreetly clip the microphone to your vestments or tie and keep your hands free. In the end, the people that tend to use this mic set are broadcasters. Whether you need mics for on-location reporting or in-studio recording, these microphones offer the features that you need. You get two transmitters that have a range of 330 feet and provide up to eight hours of use before they need recharging. When shopping for the best wireless lapel microphone, it is essential to find a mic that is built to last. It should have a durable, rugged design that helps prevent wear and protects the mic from damage. These microphones are small and prone to accidents. A durable design can help you avoid the need to replace an expensive lapel mic. Lapel mics are designed to be small. However, you may also want it to blend in with the speaker or performer. These microphones often include clips, so that they can be clipped to a shirt or collar. The sound pressure level (SPL) refers to the max decibel level that the microphone can pick up before the sound starts to get distorted. A higher SPL rating may be needed if you regularly work with live instruments or vocals. The SPL is just one factor that impacts the overall quality of the sound. You also need to consider the directional pickup of the mic and the overall quality of the design. Omnidirectional mics tend to work best for lapel mics, as they can pick up sound from all directions. We selected the Sennheiser EW 112P G4 as it includes the features that you need in a quality lapel microphone. You get clips for securing the mic to clothing, wireless transmitters for connecting the microphones, and reliable microphones that deliver clear sound in most settings. Another reason that we chose the Sennheiser EW 112P G4 microphone set is that they are easy to use. The microphone connects to the transmitters, which feature simple controls and setup for connecting the transmitters to your recording equipment or sound system. You also get quality transmitters. They offer a 100-meter (330 foot) range and operate for hours. You get an all-in-one wireless microphone system for use in a variety of settings. The main advantages of the Sennheiser EW112P microphone include the small size of the microphones, the inclusion of two different microphones, the transmitters, and the overall quality of the sound. The only drawbacks include the cost and the pickup patterns. These mics are small and easy to attach to clothing for discreet operation. You can clip them inside a collar and then run the cable through the shirt to the wireless transmitter strapped to the back of the waist. You also get two different mics, giving you more options for choosing a pickup pattern that suits the environment. The transmitters and the microphones also deliver clear sound with minimal noise, even when using higher sound levels. The two drawbacks are minor complaints that do not affect everyone. Some people may not want to pay close to $600 for two microphones, especially when they currently only need to add one microphone to their gear. The other issue is the pickup patterns. You get two microphones, one with omnidirectional pickup and one with a cardioid pickup. While most people will enjoy getting two different types of mics, not everyone needs two varieties. For example, if you have two broadcasters at a desk, you may prefer them to both use the same type of mic, which would require an additional purchase. The Sennheiser is a great buy for those that need a compact, lapel microphone. These tiny mics can deliver exceptional sound. While they can be used for live performances in small venues, they are mostly intended for recording speech. You may need a lapel mic for broadcasting, podcasting, on-location reporting, and theatre performances as well as for your pastor or clergyperson. The Sennheiser EW 112P is designed for these settings thanks to its simple, durable design. It includes clips so that you can easily attach it in a discreet spot on the speaker or performer. However, the best feature is the variety of equipment that you get. This lapel microphone set includes two microphones and two transmitters. One of the microphones is omnidirectional while the other is cardioid. You can also ensure that the microphones are compatible with the wireless transmitters, as they are sold together in a set. In the end, the Sennheiser EW 112P microphone set offers convenience and quality at a decent price. 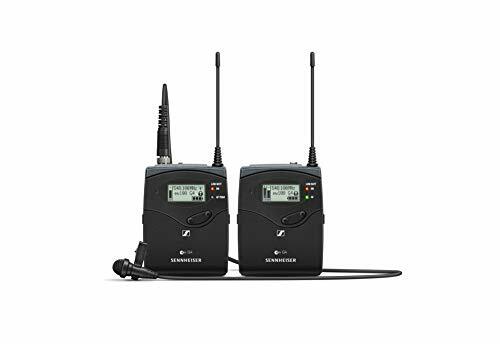 The wireless transmitters have a range of 330 feet and eight hours of operation time, which should meet your needs in almost any situation that requires a lapel mic.